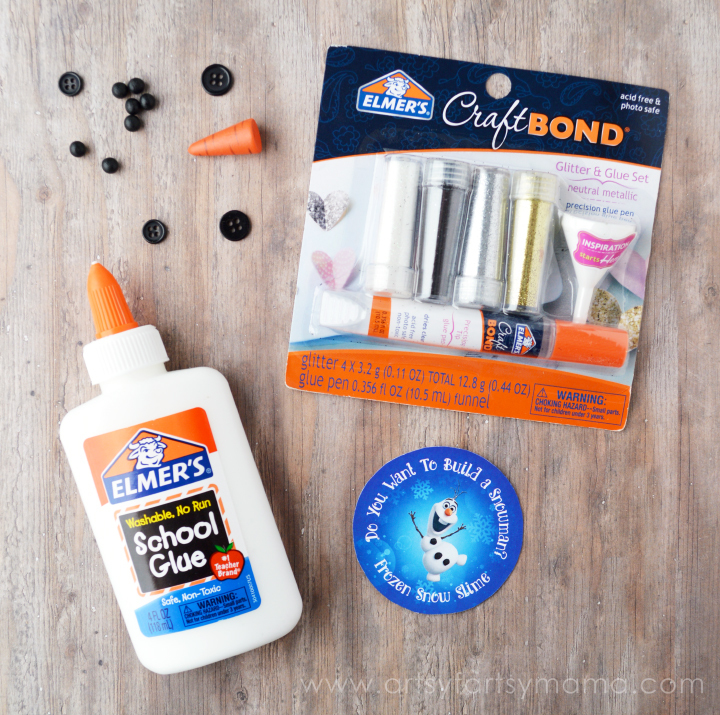 Thanks to Elmer's for the supplies used in this post. All opinions are my own. Winter is upon us, which means my daughter will most likely be pretending to be a real live Elsa here pretty soon... For those of you who don't get snow or are looking for a much warmer option than playing out in the cold, we've been working on creating some Frozen Snow Slime with Elmer's for you! Empty the glue bottles into a large mixing bowl. Fill three of the empty glue containers with hot water, then place the lid on and shake vigorously. Pour the water into the bowl. This way, you can get any excess glue out of the bottles! Stir the mixture until the water and glue are combined. You can also add glitter to your mixture if you'd like a sparkly snow! 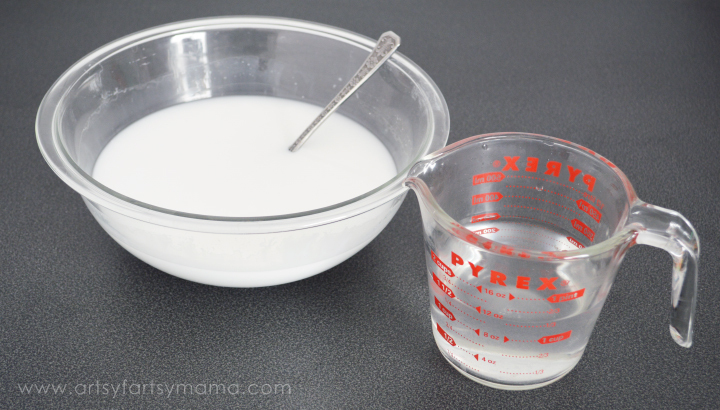 In a small bowl or glass measuring cup, add the hot water then the Borax. Mix together until the Borax has completely dissolved. Now, for the fun part!! Slowly pour the Borax mixture into the large bowl with the glue. Stir the mixture until it starts to thicken. 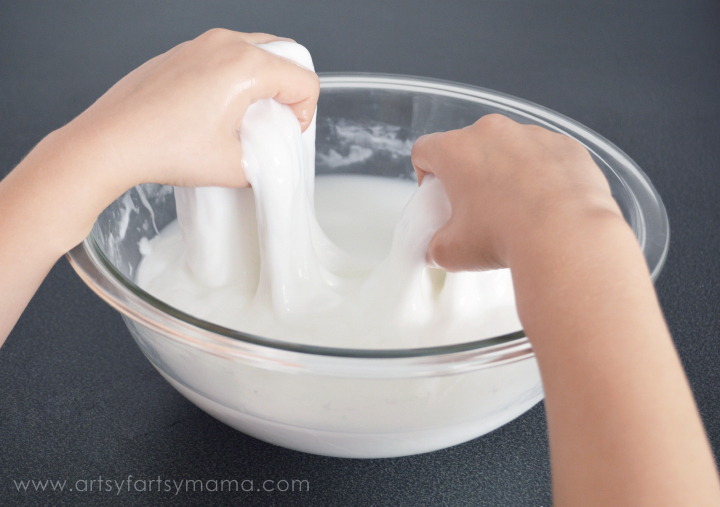 Now, dig your hands in and knead, stir, and squish until the water is absorbed and you have the perfect slime. The slime is fun to squish your hands in, rip apart, mold and watch it melt. Adding things like buttons, plastic confetti, and more into frozen snow slime just makes it more entertaining! For a little more snow-like feel, place the slime in the refrigerator for about 10 minutes. 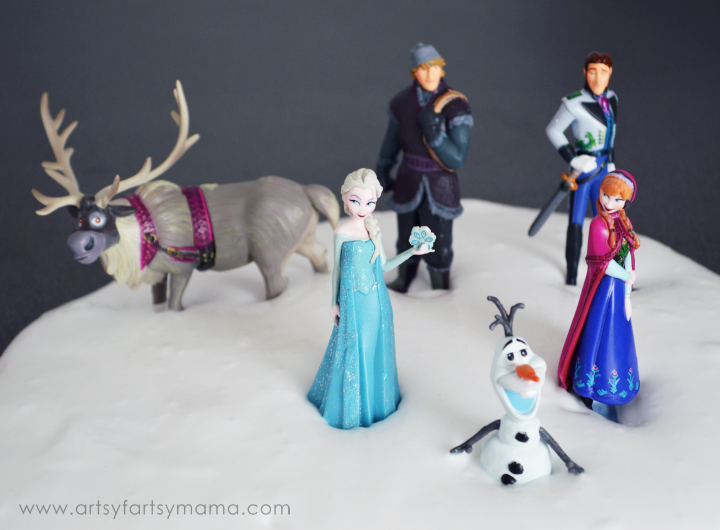 Another reason we call this "Frozen" Snow Slime is because it's the perfect way to play with Frozen figures! Elsa can create the snow for everyone, and kids can reenact their favorite scenes or create their own stories with their favorite Frozen characters!! The figures we found are plastic and washable, so they are a super fun accessory to the snow slime! And of course, whenever anyone brings up Frozen, at least one person in the room will start singing "Do you want to build a snowman?"... right?? My daughter has spent all afternoon building snowmen using buttons, beads, and a little wooden carrot nose. It was so fun watching her build snowmen in every shape and size, with all kinds of faces. Their imagination is really the limit! And like every snowman that has ever been built, eventually they have to melt. Snowmen built of frozen snow slime, however, start melting immediately and it's so funny to watch!! Roll the slime into a ball, set it down to put the face together, and within a few minutes, the snowman's face is melted! 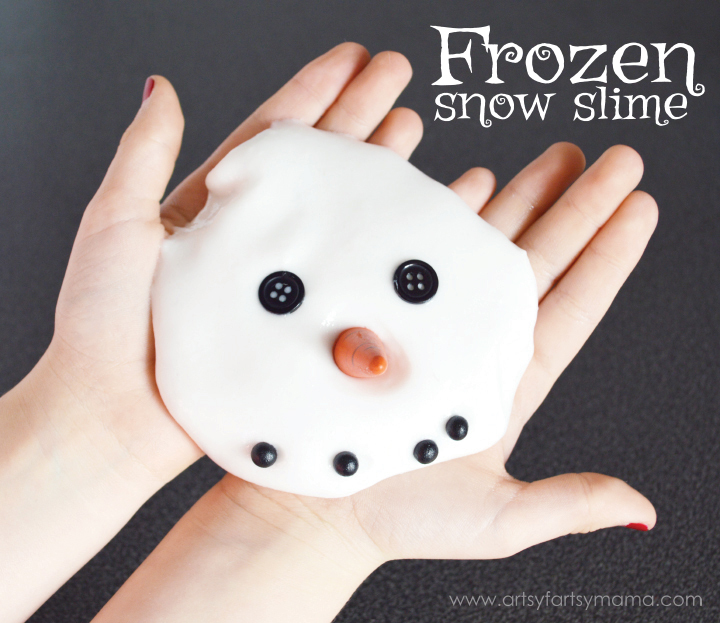 Frozen Snow Slime also makes for a super fun gift or party favors! Simply clean out a small mason jar, then fill it up with some slime. Add some buttons and snowman accessories at the top of the slime, then close it up with the lid. 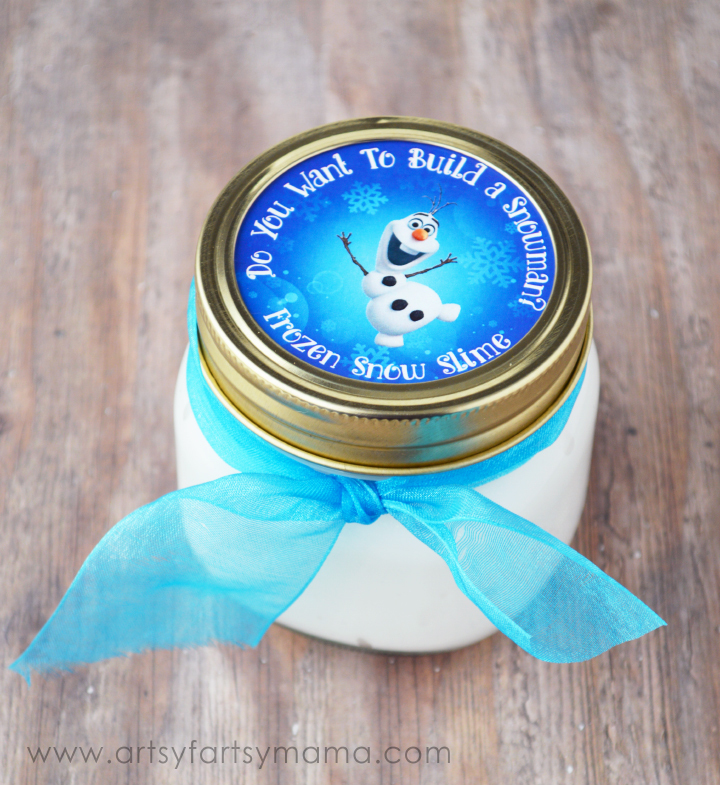 For some extra "Frozen" fun, you can stick one of my free printable Frozen Snow Slime labels to the top of the mason jar lid with some CraftBond® Permanent Dot Runner. Tie a ribbon around the jar, and the snow slime is ready to be given away! If you keep the slime in the jar or in a sealed plastic bag, the slime should last a few weeks. Have fun! I'd love to hear if you make these with the kids in your life. Leave a comment here or send me a picture of your project via email or tag me on Instagram (@artsyfartsymama)!! This is the most fun gift ever! I love it! i used the amount of water that this calls for and there is water that didnt get absorbed. is there suppose to be extra water?